I love little multi-taskers, especially when they come in cute whimsical packaging! Packed in a chubby 4.0ml click pen with Benefit’s usual out-of-the-world packaging design, here’s Benefit’s newest product for fall 2015 which promises to take you (and your eyeshadows) to the skies! From the product packaging, – 93% said it feels calming & soothing – 94% said it relieves dryness – 91% said it extends the wear of eyeshadow After reading it’s promises, I decided to bring the product out for a test drive under ‘harsh’ conditions to see if the product is true to it’s promises, or just some marketing gimmicks. Watch my video review below and don’t judge me for wearing eye-shadow to tree climbing activities! So what are the multiple tasks that this eye-primer do? 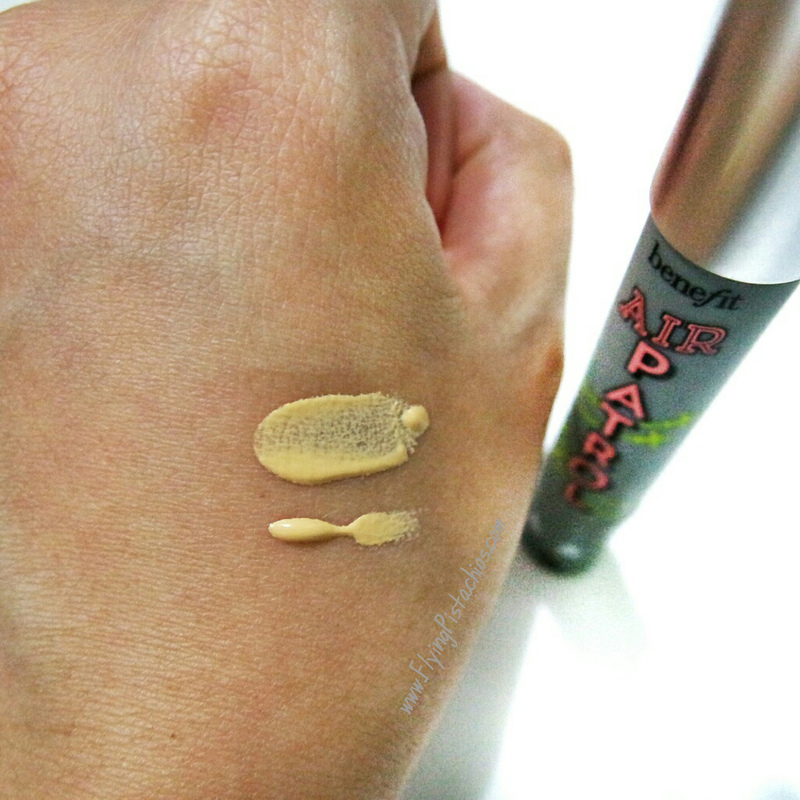 1) Other than being a eyelid primer that lock on eyeshadoe, 2) It has SPF 20 PA +++ (awesome!) 3) Properties of a BB Cream which give it colour correcting properties 4) Protect & Hydrate 5) Boosts EnviroDefend Complex that protects your delicate eyelids against the sun, smoke and pollutants 6) It also has a Cushion Calm Tip that claims to be softer than your pinkie! Let’s take a closer look at the Cushion Calm Tip. Basically it is a memory gel angled tip where the product is pushed out from (twist bottom, one twist for each eye). It’s soft and rounded, designed to create a stress-free and pressure-free application experience. Although I honestly find my pinkie softer :P, this tip sets the product apart from other eye-primers in the market. It does apply and blend out the product for you – no messy fingers and it’s one click application ensure no product wastage/ over application. I still do use my fingers out of habit though. The product comes out light yet creamy with a colour true to the above picture. It carries a tint which does a great job to colour correct your eyelids, giving it a nice, clean and youthful look. I sometimes use it without eyeshadow, just for it’s colour correcting purpose. The product blends easily and leaves no unsightly streaks. The Benefit Air Petrol Eye Primer also does a surprisingly great job in intensifying your eyeshadow colour. The only other eye primer which I know that does this as well is the NARS Pro-Prime Smudge Proof Eyeshadow Base but it lacks SPF and the skin loving properties that Benefit Air Petrol boosts. The rubber packaging is also a pain, picking up dirt and shimmers quickly. The cult favourite Urban Decay Eye Primer does not even do this job well. So kudos to Benefit! I’ll be careful and more light handed when applying my eyeshadow though, as the product is really good at catching the colours, blending becomes a little tougher. 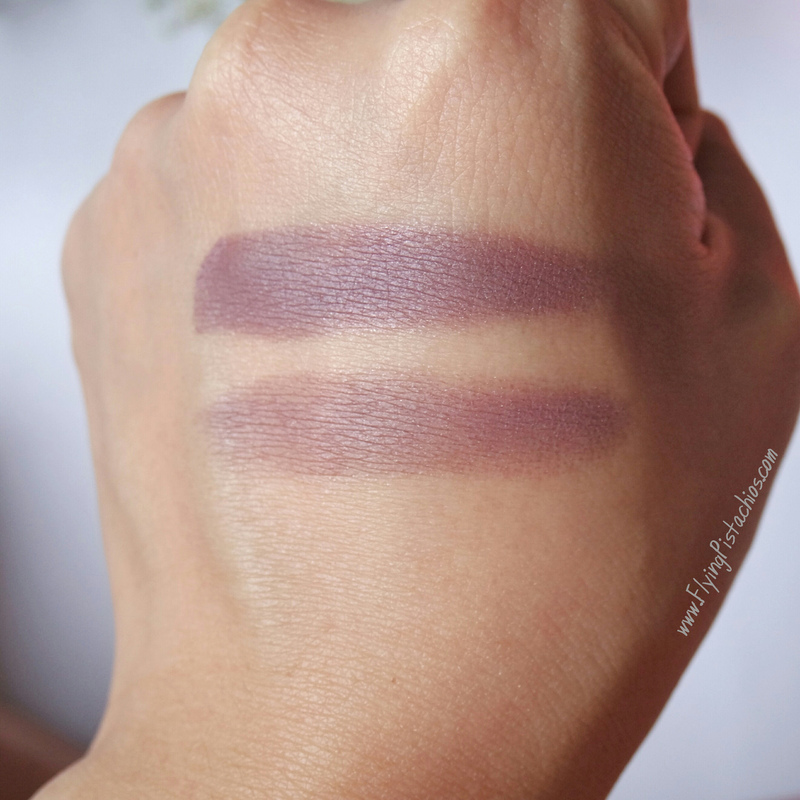 If you find yourself taking more time/ unable to properly blend out your eyeshadows, try using transition colours instead. I find no issues piling up the colours with this product on! 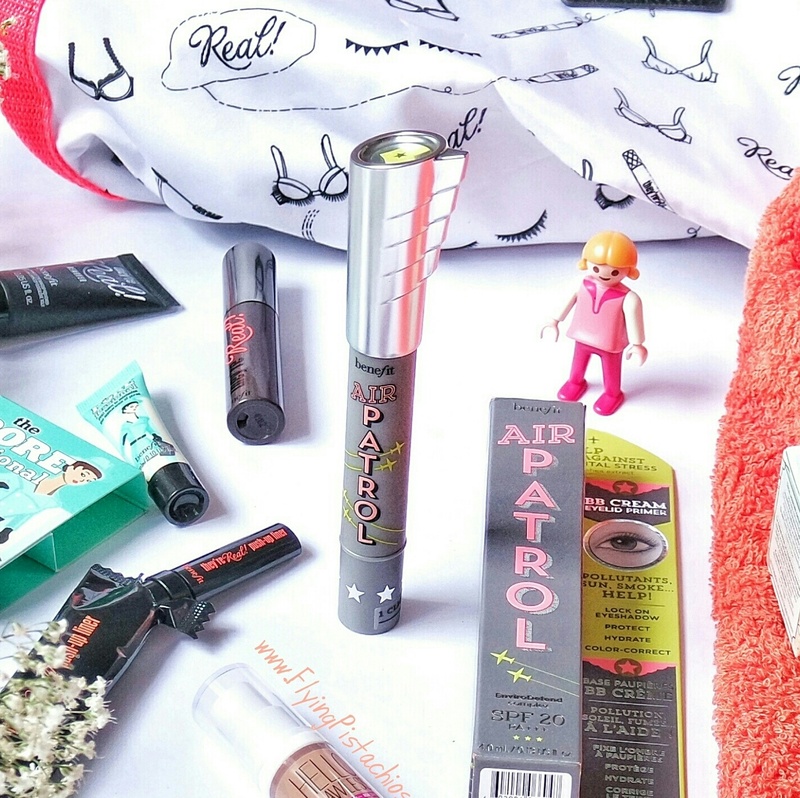 Love the Benefit Bag and the delux product samples that came along in my media kit! I have been using this eye primer almost everyday since I received it and I must say, it is fast becoming my favourite eye primer. It keeps my eyeshadow on for more than 10 hours with no creases and smudges, even outdoors in the humid Singapore weather. I even triple tasked it by wearing it under my eyebrows to last Sunday’s FunFest at Sentosa where we splashed around in water slides and bouncy castle obstacle courses – My eyebrow powder was all in place! No smudges, no smears, no disasters! I’ll definitely repurchase this product myself! Go get yours! 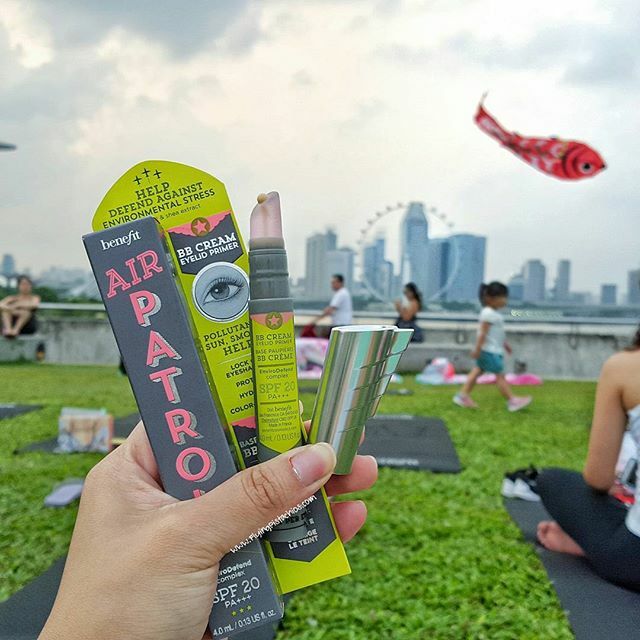 Image taken at media event where we relaxed our mind and souls under the stars with the amazing Singer and Yoga Enthusiast, Sandra Railey Tang from The Yoga Co.